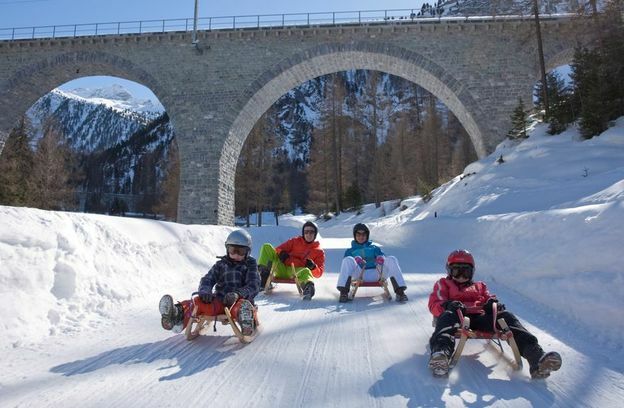 It can be quite intimidating if you are the only person on the ski trip who doesn’t ski, but fear not because Graubünden offers plenty of exciting alternatives, so it seems Graubünden is not just for skiing. For non skiers, cross country is an ideal way to get a first feel of a pair of skis on your feet. Originating in the Nordic countries, it’s a great work out for practically every muscle group and it’s a sport highly regarded by experienced skiers too. Most of the courses are prepared with a set of parallel ski grooves cut into them and using an alternative stride style and long poles you glide yourself across a combination of flat, uphill and gentle downhill runs mixed with a few turns for good measure. 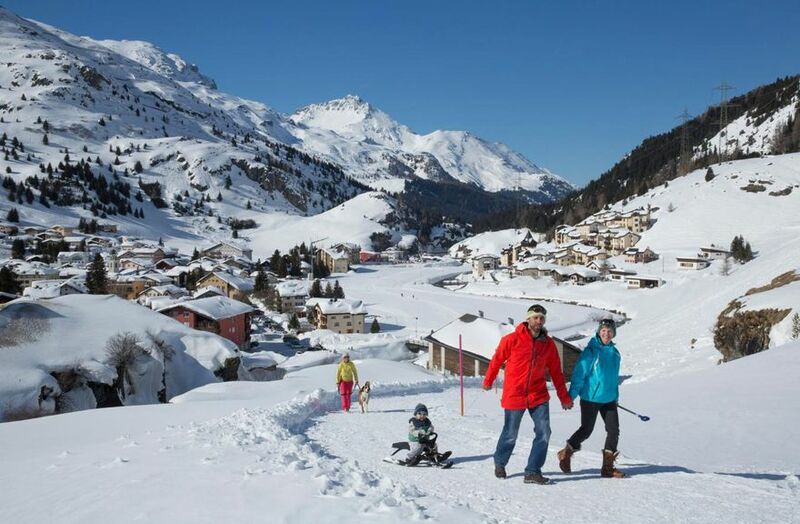 The Upper and Lower Engadine Valley, Davos Klosters, Lenzerheide and Flims – Bargis – Trin – Sagogn are at the very heart of Graubünden’s cross country skiing regions, where you’ll find over 400 kilometres of well prepared trails to explore. 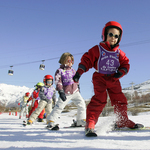 With twenty two cross country ski schools to choose from and a wealth of terrains from forests to sunny plains, all with varying degrees of difficulty, you’ll be spoiled for choice. 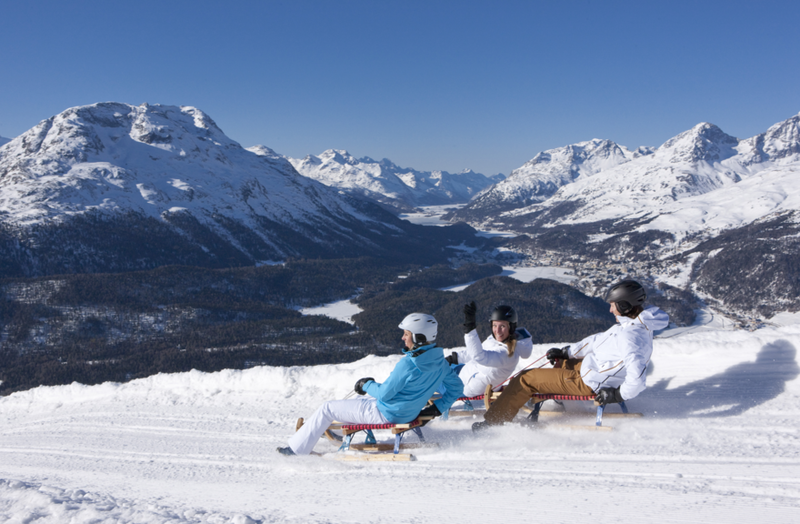 If the idea of dropping 400m along a 6k track lying on a wooden seat with metal runners is your cup of tea, then the legendary Preda to Bergün toboggan run is a not to be missed experience. First off, the Rhaetian Railway takes you every half an hour on a stunning seventeen minute alpine ride up to Preda giving you glorious views as it loops around the mountains, then you’ll forget about the views as you concentrate on negotiating the hair raising twists and turns hurtling back down to Bergün. You’ll certainly beat the train coming back on your way down though, as the record is just five minutes and twelve seconds. As night falls, the drama increases as floodlights light your way down a fast freezing and therefore ever faster track. Having conquered Preda- Bergün by day and night, you can try your hand at the big one, the Darlux-Bergün run, just 4k but dropping a jaw-clenching 576m! Flims-Laax has become synonymous throughout Europe for leading the way in high quality winter freestyle facilities with more rails, half-pipes, kickers and boxes than you can shake a snowboard at. Laax’s snow parks regularly host the British Snowboard and Freeski Tour finals but it’s not just about Olympic level free-style as for those of us a little less adroit on the boards, there are ample opportunities to still enjoy free-styling whatever your experience level. There are four parks, Beginner, Ils Plauns, NoName and Curnius and each one is designed to accommodate specific experience groups; from the gentle 3m kickers and rails of the obviously named Beginner park to the more adrenaline charged obstacles of 1,000m long Curnius not to mention the 100m half pipe and the positively white nuckle160m super-pipe, Europe’s biggest half pipe run more commonly referred to as ‘The Monster’. Laax’s snow parks are open from October through to mid April. 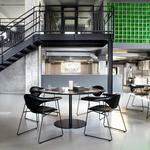 Of course, if the going gets too tough, you can always chill out at the NoName Cafe overlooking the NoName park. Founded in 2003, the Freestyle Academy in Laax was initially created to help teenagers and younger children improve their general snow based skills with a particular emphasis on learning tricky freestyle manoeuvres in a very safe environment. Fast forward seven years to 2010 and located right at the Laax valley base station, the academy now operates an impressive year round state of the art indoor hall, the very first of its kind in Europe, attracting the pro riders looking to hone their moves as well as mere mortals intent on just having some fun. Combining two ski jumps (ski, snowboard, skateboard BMX and dirtbike), a wooden half pipe with added bowl, corners and extensions, integrated rails and boxes and four trampolines and a foam landing pit, this is an outstanding padded environment using synthetic Snowlex where you can try out all kinds of free-styling without risking life and limb. Bear in mind, you will need to complete a 2 hour induction course before you can be let loose! Nicknamed ‘chess on ice,’ because of its reliance on teamwork and strategy, Curling is a sport where teams glide ‘stones’ down an ice track towards a target, not unlike bowls and it is fast gaining popularity across Europe. Originally conceived in Scotland, it was Team GB’s success in winning a gold medal at the 2006 Winter Olympics that has perhaps helped raise the sport’s profile in Britain. The opening of the six rink Waldhaus Arena in October 2009 heralded the dawn of a Curling explosion in Flims. It transformed it from a resort offering this once curious niche sport as perhaps a relaxing alternative activity after a hard day on the slopes, into a centre of excellence attracting top rated curlers from all over the World. Over in Davos, a winter magnet for the rich and famous, you’ll find the The Natureisbahn, on Davos Platz, Europe’s largest natural ice rink and with the huge indoor ice rink next door, it’s a veritable curling Mecca. 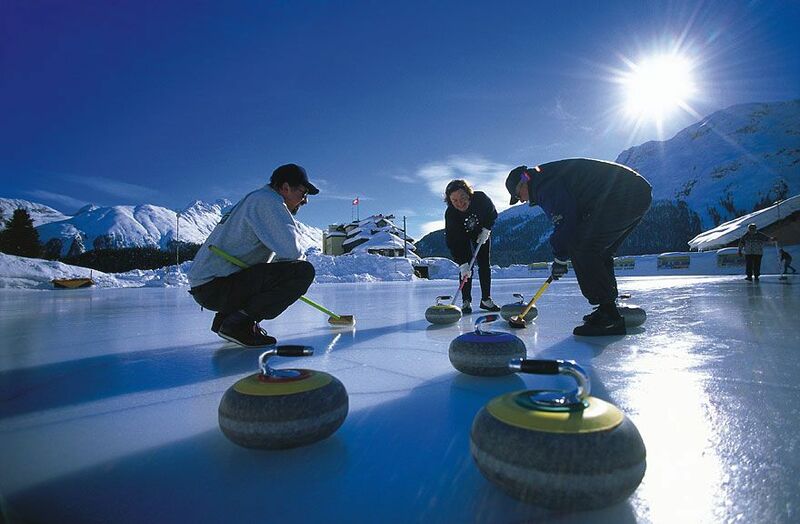 The well established Davos Curling Club offers 2 hour slots and tuition.